Immediately we are in a state of Visual Overload...where to look first! It is barely after 0600, and already the city is buzzing like a bee-hive! Jolies scènes de rue, j'aime beaucoup. 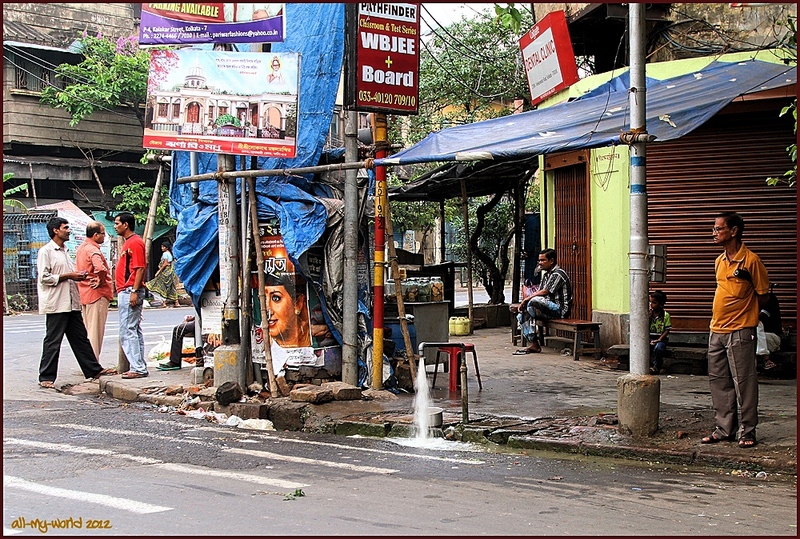 Ray: Il y a tellement d'intérêt dans les rues de Calcutta, Martine. I'm afraid I would feel a bit claustrophobic! Elizabeth and Astrid would be on the same claustrophobic page, I'm afraid. Furthermore, I don't see one single woman thus far on this trip, Ray. Does this indicate at all, I wonder, if Kolkata is a man's world? Ray: The gals are all having their daily sleep-in, Ginnie...as they wake up you will begin to see them in my pics. Ray: Kolkata is a very hot place, Lisl...about like where I live...so it is good to be up early and getting the day set up before the sun dominates things. Such different way of life to my own fine city.I bet the flies love that food under the lamps. Ray: Surprisingly, Alan, there are not so many flies around the food. Ray, what a fabulous series here and I love the streetlife (not to be there in real though). This is such a different world. I do have a question, in the last picture I see that water running in that pan underneath it, however there is not something to turn off the water. Isn't that waste? Ray: The running water is a public water-filling station, Astrid, and would nearly always have folks at it filling they bottles as in the third shot, or washing...I think they keep these stations as simple as possible [no valves or filters] so the water is reliably available. The water that escapes is also doing something towards cleaning the street. 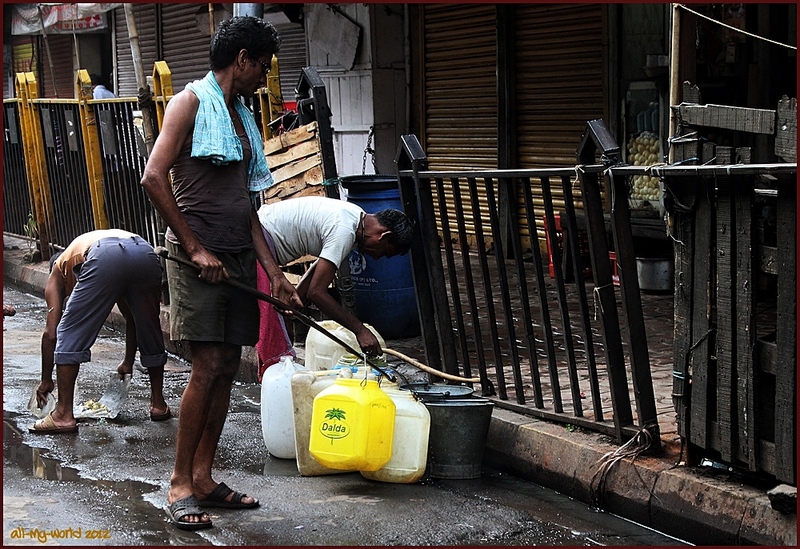 There is no water shortage in Kolkata, although what is available is seriously polluted. No question, this is street photography heaven..
Ray: A truly wonderful city, Chris...and, our 5 hours of touring is barely started. Ray: Kolkata n'est pas la ville la plus peuplée dans laquelle j'ai été, Claudine, mais elle est certainement plus peuplée que la plupart des autres. Kolkata is not the most crowded city I ave been in, Claudine, but is certainly more crowded than most. The grub doesn’t look too appetising Ray. This all looks very poor. Ray: My rule-of-thumb for eating in India is "Eat Vegetarian", Chad. Best time of day! I would be up - with the grandchildren perhaps. Excellent images, Ray. Ray: I like early mornings, Mary, and usually wake up about 0400. These pics were made about 0630. I must admit that I do find the surroundings some what off putting although I must admit they make for fine photo opportunities. Ray: I think Indian cities are not for everyone, Brian. A nation of traders, busy trading. Ray: Its about 0630, Tom, and the city is already like a beehive. Ray: I certainly got the impression that Kolkata is a lively city, Bill...I loved it! 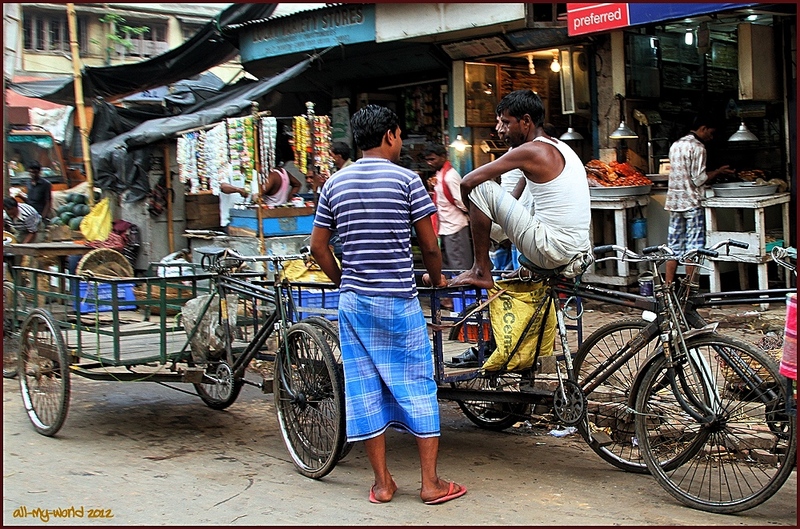 Kolkata is indeed a heaven for street photography, Ray. and most of the activity takes place in the early hours during which bargains are struck, transactions completed and goods/money change hands. Ray: Thank you, Ayush. That certainly matches my observations of this dynamic city.